During the last few months I have profiled a number of the airworthy survivors of various historic types around the country. With this year marking the 75th Anniversary of the Battle Of Britain it seemed fitting to outline the UK’s Spitfire population, this is no small task as there is now quite a large population being added to every few months. As such these posts will be split into sections and released periodically, hopefully finishing in March around the anniversary of the types first flight. Until recently the first production version of this iconic aircraft was under-represented somewhat, with only one example remaining in airworthy condition. Thankfully in the past few years this has all changed thanks to the Aircraft Restoration Company, who have restored three stunning examples of the Mk 1. To begin, lets take a look at the longest serving civilian Mk 1. AR213, a Mk 1a, was built by Westlands at Yeovil and was delivered in 1941. Throughout the war the aircraft moved through a number of Maintenance and training units before ending up in storage at RAF Little Rissington in August 1944. The Spitfire was then acquired by Group Captain Alan Wheeler in 1947 for the impressive sum of 10 pounds! From 1949 the aircraft was stored in a dismantled state at Old Warden and latterly Henlow until being restored to fly for the Battle of Britain movie in 1967. ‘213 was restored again in 1970, this time at Booker, for new owner Patrick Lindsay, who operated the aircraft until 1990. The aircraft then changed owners again but remained based at Booker. 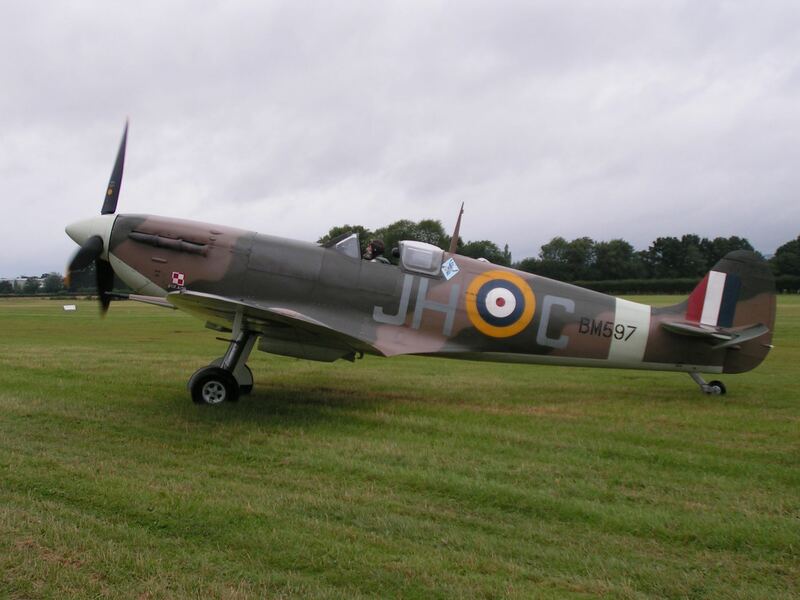 In 2002 it was decided that the Spitfire would be restored back to stock Mk I condition. This project was finished in 2007 when the aircraft flew again from Booker. In 2011 AR213 was sold once again, this time to Spitfire the One ltd, moving from Booker to Duxford. The aircraft was repainted into an original 57 OTU paint scheme for the Eagle Squadron display at Duxford in May 2013. The Spitfire is currently looked after by The Fighter Collection. After 50 or so years as the sole Mk I, AR213 was finally joined by P9374 on the 9th of September 2011. This Spitfire set a new benchmark for Spitfire restorations, representing an even earlier example of the classic design, featuring the shorter spinner and features such as hand-pumped undercarriage. ‘374 was built in Southhampton in 1940 and first flew in February of that year. On March the 6th the Spitfire moved to 92sqd at Hornchurch in Essex. It’s service life was short as the aircraft was shot down over France on the 24th May 1940. Having landed on a beach at Calais, the wreck was kept in a fairly complete state and was recovered in 1980, going on to become part of the Le Bourget air museum. The wreck made its way back over the channel in 2000 and the registration G-MKIA was allocated. The aircraft remained stored until 2007 when restoration work really began. Following a groundbreaking restoration process at Historic Flying Ltd, with the fuselage being constructed at Airframe Assemblies on the Isle of Wight, John Romain took the aircraft up for its first flight since landing on that beach at Calais on the 9th September 2011. With its distinctive early war camouflage and black and white identification underwing markings, the aircraft soon became a must see on the circuit. I remember being lucky enough to be at the Goodwood revival meeting later that month, where a large gathering of Spitfires was being assembled. To my surprise as one formation arrived overhead i saw the black and white wings and could hardly believe my eyes. A wonderful machine, perhaps the “purest” version of RJ Mitchell’s original design still in the skies today. This Spitfire was sold at auction in London in July 2015 to an undisclosed owner. Very much a sister ship to ‘374, N3200 is another Mk Ia featuring the early design qualities and a number of highly original details. Following on from what had been learnt during the first Mark I project the Duxford team were able to outdo themselves yet again. Built in 1939 ‘3200 is a special aircraft for Duxford, it was one of the Spitfires to operate with 19 sqn out of the airfield in April 1940. Much like ‘374, service life was short, being shot down over France in May 1940. Much like the other project, this restoration began as a wreck being recovered from a beach, this time near Sangette, France. The wreck was recovered in 1986 and went on display at the V3 museum untill 1995. In 2000 the aircraft was aquired by Simon Marsh and Thomas Kaplan and moved to England. Once again after a few years in storage restoration began in 2007. The restoration came to its conclusion on the 26th March 2014, when John Romain took N3200 up for its first flight since 1940. The initial testflight was extended slightly due to a breif hailstorm arriving over Duxford. As part of the attention to detail involved with this project a number of non-standard parts were used. It was discovered early on that the original N3200 had a different rear view mirror, an example of which was sourced and placed on the aircraft. This gives ‘3200 a very distinctive whistle when flying past. This makes it very easy to pick out even when flying with a number of other Spitfires. Both of these early Spitfire restorations are truly incredible feats of engineering and attention to detail, seeing both these aircraft flying at airshows up and down the country has truly been a joy to behold. An insight into the process of restoring these pieces of history can be seen in Guy Martin’s recent channel 4 documentary tracking the progress of N3200 as it was rebuilt. In July 2015 this spitfire was gifted to the IWM. Another Mk 1a restoration to recently join the ranks is that of X4650, this paticular example has more familiar lines to the rest of the Spitifire family, with the more pointed spinner in place. It is, none the less another wonderful representation of an early Spitfire. This aircraft was built at the iconic Castle Bromwich Factory. The aircraft’s service life ended in December 1940 during a formation training exercise, ‘650 was piloted by Howard Squire and was being led by Battle Of Britain pilot Al Deere. Encouraged to keep as close as possible Squire ultimately made contact with the lead aircraft causing both to ditch, thankfully both pilots involved were unhurt. The aircraft was discovered in a river in 1976. The aircraft was restored to flying condition under the care of Peter Monk. The first flight since 1940 was carried out by Paul Bonhomme on the 9th March 2012 at Biggin Hill. The aircraft has since been sold to the Friedkin family in the USA, but for now remains at Biggin Hill. ‘650 is often seen at the Duxford Flying Legends shows as well as other select events throughout the year. It is amazing to think that five years ago there was only one airworthy Mk 1 Spitfire, yet in 2014 we saw a four ship display overhead Duxford, long may the early Spitfire resurrection continue! 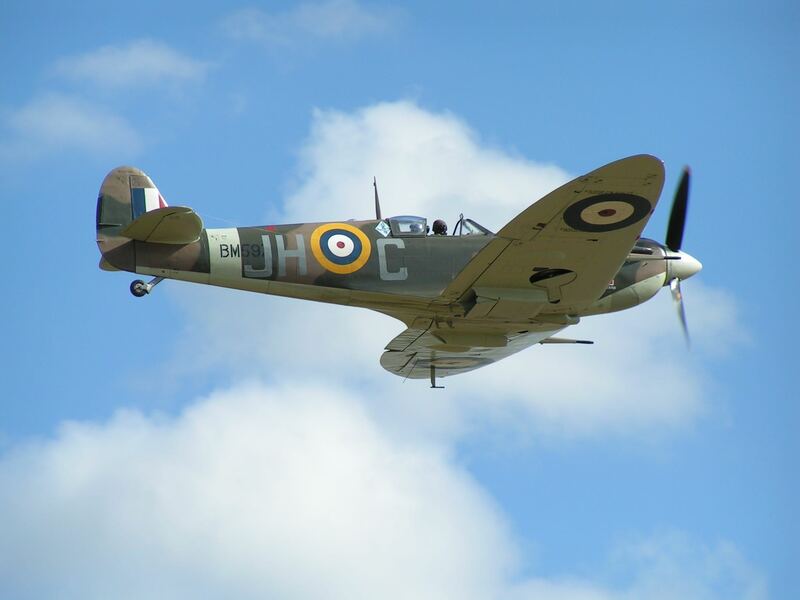 Only one Mk II Spitfire remains in flying condition, it is owned by the Battle Of Britain Memorial Flight. Built at Castle Bromwich in 1940 the aircrafts was first posted to 266 sqd at Wittering in September 1940 before moving to 603 sqn at Hornchurch. The aircraft crash landed following combat on 17th October 1940. (Bullet holes from this encounter were still evident on the aircraft until a major overhaul in 2008.) The aircraft went through a number of maintenance units before finally being put into store at RAF Colerne in 1944. 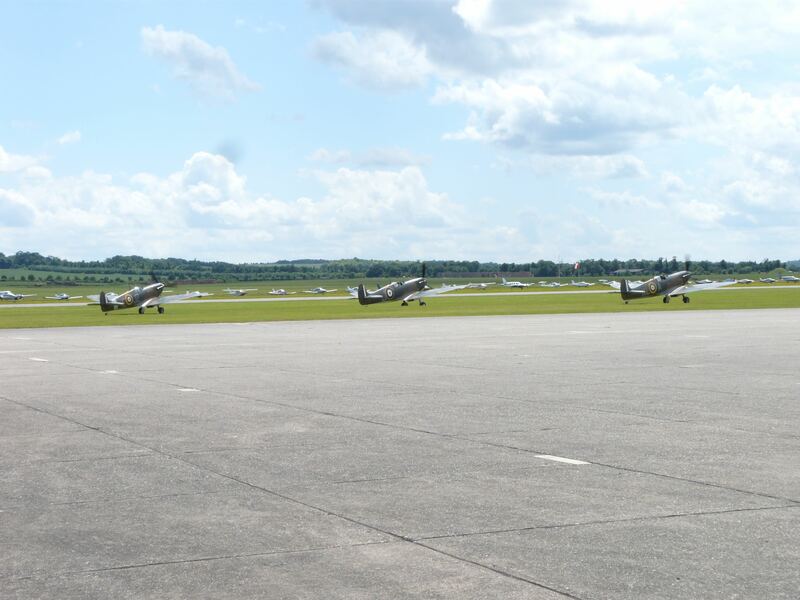 The ‘350 remained at Colerne until 1967, when, like many other Spitfires at the time it was taken to RAF Henlow to be restored to flying condition to play its part in the Battle of Britain film. In October of 1968 it was returned to the RAF, and became part of the Battle of Britain Memorial flight. Since then the aircraft has remained in the RAFs care and has been put through a number of different paint-schemes over the years. With the advent of the Mk V variant, the Spitfire design slowly started to move away from its earlier designs, the introduction of a more powerful Merlin engine led to a slightly longer nose and cannons were added to the wings, changing the aircrafts profile a little, as seen below some aircraft also had clipped wings, allowing a better roll and turning performance and low altitude. Despite all these changes the V is still regarded a “baby” in the Spitfire world and is regarded by many pilots as being the perfect Spitfire and as close to RJ Mitchell’s original intentions as it got. Like so many Spitfires, EP120 was also built at Castle Bromwich, being delivered to 501 squadron, based at Ibsley in Hampshire in June 1942. During this time the aircraft was credited with a number of victories at the hands of Squadron Leader Geoffrey Northcott. After being repaired following accident damage the Spitfire claimed one more victory in August of 1942. After the war EP120 was stored at St Athan until 1950, being used as an instruncional airframe and a gate guardian. The role of gate guardian was them performed at numerous bases until 1967 when the Spitfire was involved with the Battle of Britain film, though only on a static basis. After another stint in storage at St Athan, EP120 came up for disposal in 1993 and was bought by the Fighter Collection. The aircraft was registered G-LFVB and restored by Historic Flying Ltd at Audley End, returning to the skies again in September 1995. The aircraft has the distinctive feature of Clipped wings and is often seen at airshows throughout the year. In 2013 EP120 was used as the lead aircraft for the Horsemen’s special Spitfire formation display at Flying Legends. For this role the wingtips were replaced, quite a rare sight on this Spitfire. Again built in Castle Bromwich, Mk Vb BM597 ended up with 315 (Polish) Squadron in May 1942, before moving to another Polish Squadron, 317, in September. The aircraft was damaged in a landing accident and was declared a class B write off in 1943. After repairs and modifications the Spitfire was eventually delivered to St. Athans in 1945. After a number of years being Gate guardian at various RAF stations, as well as a breif stint as a static aircraft in the Battle of Britain film, the aircraft was eventually aquired by the Historic Aircraft Collection in 1988. Restoration work began at Audley End in 1992 and the first flight was carried out in 1997. This Spitfire was for many years one of the more common sights across the country, in more recent times it has made fewer airshow appearances but has been used for “fly with a” Spitfire experiences operating down at the South Coast, allowing members of the public to fly alongside a spitfire. Another Spitfire still owned and flown by the Royal Air Force as part of the Battle Of Britain Memorial Flight. First assigned to 222 squadron in August 1942 ‘910 passed through a number of other squadrons before finally ending up in storage in 1945. Purchased by Alan Wheeler in 1946, the Spitfire was registered G-AISU. After a short civil life including some air racing, ‘910 was returned to Vickers-Armstrong in 1955, who donated the aircraft to the Battle of Britain Memorial Flight in 1965. In 1968 the aircraft flew in the Battle of Britain film. Following a couple of accidents during the 1970s the aircraft underwent a rebuild, flying again in October 1981. The aircraft flew on with the Flight for a number of years before going through another restoration, once again returning to the skies in 1997. 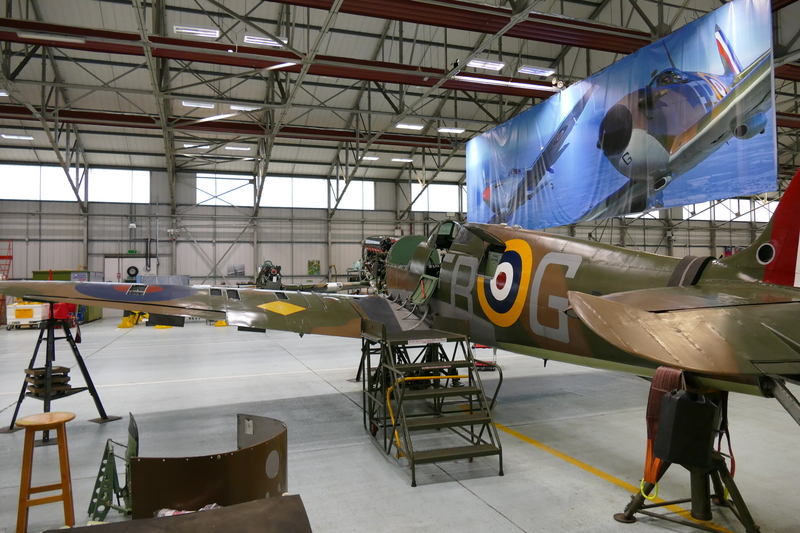 AB910 now wears the colours of a 64 Squadron aircraft flown by Flt Lt Tony Cooper named “Peter John I.” The scheme presents a very nice change for an early Spitfire, as it features D-Day stripes. This rebuild looks to have been one of the more drastic of the Memorial Flight in the last few years as ‘910 has returned to the traditional 3 bladed prop and 3 exhaust stack each side engine set up.This combined with an original windscreen means the ‘910 now looks every part the graceful early Spitfire she should. Hopefully it won’t be too long before flight testing begins and she can join the airworthy ranks full time again. AB910 has now flown again and is back at Coningsby, pictures of the Spitfire departing Duxford can be seen above. Restorations and the next step..
That concludes the look at the Baby Spitfire population in the UK, there are of course, a number of long term restorations of early Spitfires which may see air under their wings this year, notably the Shuttleworth Collections Mk V AR501. 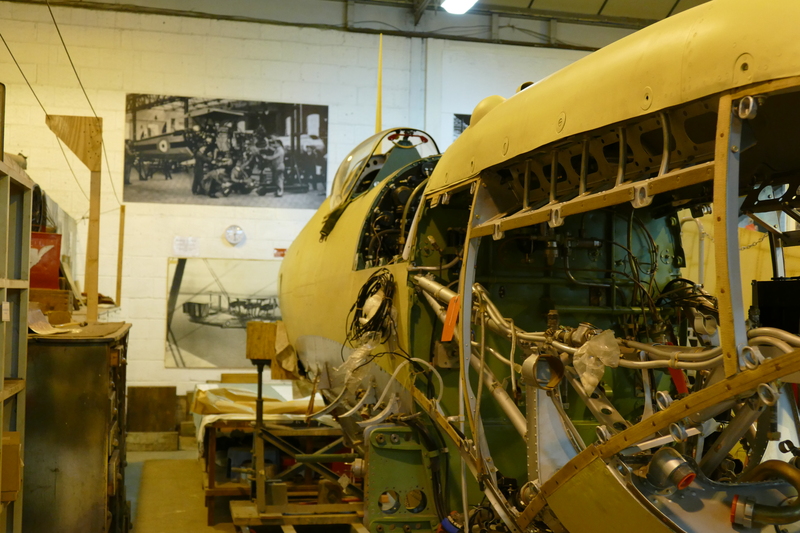 AR501, under long-term rebuild at the Shuttleworth Collection. The next post in a few weeks will look at the Mk IX and XI variants of the Spitfire, for my money the best looking of the breed. If you have enjoyed this post and would like to read more don’t forget to have a look round this site as well as joining Warbird Tails on Twitter and Facebook.